Maybe it’s heading to Oregon in a few days that’s got me thinking about berries. Or maybe it was the amazing berry and nectarine dessert my sister made for a family birthday from her new Four & Twenty Blackbirds Pie Book. It could be because it’s the umpteenth time in a week I’ve read Blueberries for Sal, one of my daughter’s current favorite bedtime stories. 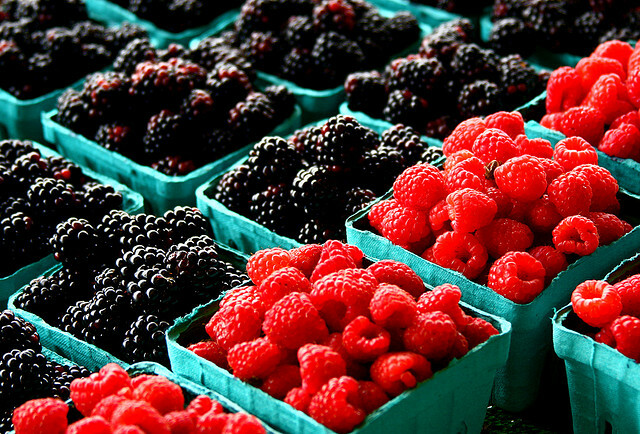 Whatever it is, I’ve got berries on the brain. Sweet, sun-ripened berries. Summer means berries for me. My childhood summers are studded with memories of picking strawberries at the u-pick place by my grandparent’s farm, then returning home sweaty and berry-stained and “helping” my mom make jam (and by helping I mean mostly eating strawberries.) Or my sisters and I often picked blueberries in my aunt and uncle’s yard using the nifty, handmade “hands-free” wooden berry picking device my uncle cleverly designed and built. And lots of hot afternoons were spent meandering in the woods behind our house, searching for ripe blackberries on our way to the neighborhood pool. While the bulk of my berry consumption involves just eating them plain or with yogurt and granola in the morning, I have a special place in my heart for berry desserts. Mix all together until crumbly. Don’t use mixer, as you don’t want it to be a dough, just a crumbly mixture. Heat fruit to boiling (use blueberries, peaches, etc.). Add sugar to taste. Put cooked fruit (with its own syrup) into a baking plate. I use a corningware glass baking plate, or you could use a pie plate. Then sprinkle your crumbly mixture over the top of the fruit. Serve with vanilla ice cream for a treat. I realize now these memories from my childhood are so special and so strong because they are the heart of what summer meant to me as a kid – being outside, being with friends and family, having loads of unstructured time to explore, to play, to think, to be. Along with my mom’s blueberry cobbler, that’s what I want to share with my kids. Posted in family, food, Uncategorized. Tagged books, childhood development, parenting, recipes.